from The Zuni Café Cookbook, pp. 324-26. I needed some comfort food this past weekend. That meant there was only one place to look. I swore I would not post another Zuni Café Cookbook, but the book is so deep that it’s difficult to judge where fair use ends. I decided I hadn’t reached it yet. And let me once again urge you to buy this book! 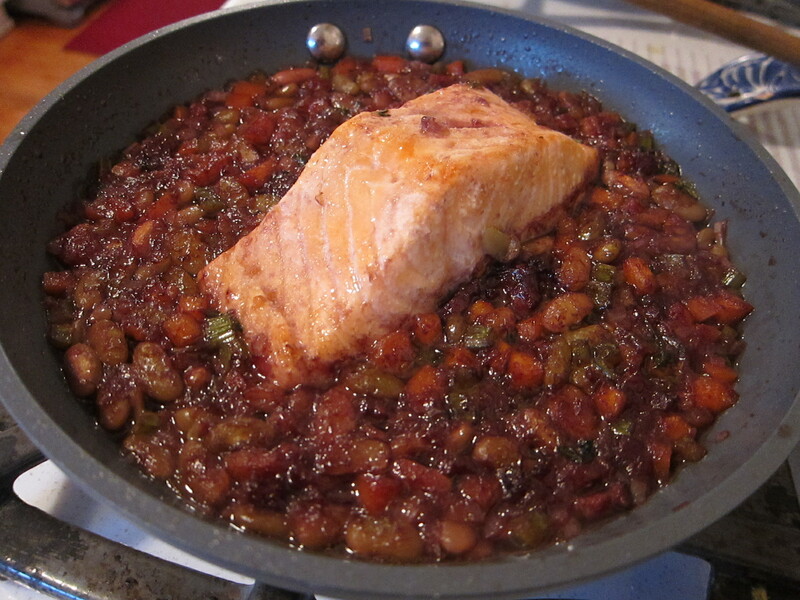 It would never have occurred to me to cook salmon with red wine and beans. I’m so glad the idea came to Rodgers. Now that I’ve made it, I’ve been trying to articulate to myself why it worked so well. It must have something to do with the so-called oiliness of the fish. Its richness sunk into the beans and drank up the wine. I made one portion for myself, so if you’re cooking for two, just double the portion. 1/3 lb salmon fillet, preferably Pacific or Alaskan, at least an inch thick. Seasoning the salmon (for the best flavor, do this several hours in advance): Season the salmon evenly with salt. Cover loosely and refrigerate. Shadowcook: Rodgers is a proponent of salting all meat, including fish, several hours, sometimes days, in advance of cooking. She urges home cooks to get into the habit of doing this, which means knowing what you’re going to eat well in advance, and promises that the meat will taste better and become more tender. I think she’s right. First, my interpretation of Rodgers’ recommended method of cooking the beans: Put the cup of dried beans in a pot. Cover with water by about an inch. Bring to a simmer. After skimming the scum off the surface of the water, add the carrot, onion and bay leaf. Partially cover the pot and let simmer until the beans are tender. That could take about an hour, perhaps longer, depending on how old the beans are. Cook them until they still have a bit of bite to them. You don’t want them falling apart, because they have a few minutes of intense cooking under the broiler later in the recipe. When the beans have reached that point, add salt. As Rodgers points out, it takes a while for the beans to absorb the salt, so judge by tasting the cooking liquid. Then add the tablespoon of duck fat to the beans. Shadowcook: By now, I hope everyone who reads this blog has acquired the habit of keeping duck fat in the fridge at all times. It just makes life a little bit richer. They also now say duck fat is good for you, but who cares? Update: Here’s the article about duck fat that reinforced my commitment to have it always on hand. Remove a cup of beans from the pot. The cooking liquid that comes with the beans is fine. Set aside. Preheat the broiler. Position the rack about 6 inches from the element. Place the wine in a small saucepan and reduce to about 1/3-1/4 cup. Add the chicken stock and return to a simmer. Turn off the heat. Place the bacon in a small ovenproof skillet and lightly brown it in its own fat over medium heat. Reduce the heat slightly and pour off all but a film of the fat. Add about 1/2 tablespoon of butter, the other half of the chopped carrot, the celery, and the other half of the chopped onion, and the sprig of thyme. Cook, stirring, until the vegetables are tender, about 6 minutes. Add the flageolets, the reduced red wine-stock mixture, the half bay leaf, another sprig of thyme, and more butter. Raise the heat to mediumm and swirl as the liquid comes to a simmer. Reduce the heat to low, add the salmon, and swirl and tilt the pan to baste the top of the fish. Make sure no beans, bacon, or bits of vegetables are perched on top of the fish, where they could burn. Place the pan under the broiler. Cook for about 6 to 7 minutes; the salmon should be quite rare and the whole surface of the dish should be sizzling and beginning to color. Watch closely; if the fish or beans threaten to char at any point, reduce the oven temperature to 500. Shadowcook: I thought 6 minutes was plenty. It depends on the thickness of the fillet. My fish came out medium-rare, which was fine. While the fish is cooking, set a plate in the oven for a minute to heat. Transfer the pan to the stovetop. Using a spatula and tongs, transfer the salmon to the plate, where it should reach medium-rare as you finish the sauce. Protect from drafts. Set the pan over medium heat and bring to a simmer. Taste. If the liquid looks or tastes thin, simmer briefly to reduce and allow the starch from the beans to bind the sauce. If it seems winy, add a splash of the reserved bean cooking liquid. Correct the salt, Swirl in more butter. Spoon the saucy beans over the waiting fish. Shadowcook: And prepare to gobble it up! I’m a little confused. You say remove a cup of beans and set aside. Are those the beans you later add to the pan with the bacon and veggies? And the beans left in the original pot, what about those? So you made more beans initially than you need for the dish? Why not make exactly the amount you need? Ah, good questions. Yes, you add those beans that you’ve set aside to the pan with the bacon and veggies. If you want to make an exact amount of beans for this dish, cut the amount of beans in half. But I suppose I have become so accustomed to having on hand cooked beans (flavored with duck fat or lard) for breakfast or dinner that I forget to mention that you can save the remainder for a separate use. Even if I’m making a one-serving dish that calls for beans, I always make more than I need. I’ll be more careful about stipulating that in the future, Jo. Thanks Sally. Appreciate the clarification. Good idea about the leftover beans. I’m curious about the whole duck fat thing, i.e. health benefits or taste. Maybe you could enlighten me, off-blog via email.